The manufacture of plastic parts, extrusions, and films are all similar in that they involve the melting of solid plastic, then the forming of it into some output product. In a common extrusion process, dry solid base material, plastic flakes, pellets, powder, or granules, is fed into a screw. 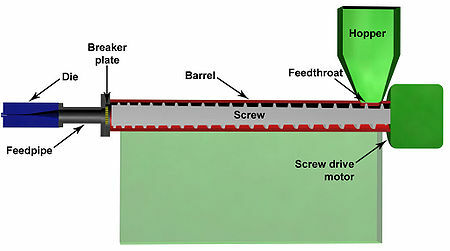 The screw is within a tubular housing called a barrel and is driven rotationally by a motor. The machining of the screw, and its rotation, forces the plastic material into an continually decreasing volume as it moves along the length of the screw/barrel assembly. The friction and pressure induced upon the plastic, as well as some carefully controlled heating along the barrel, melt the plastic in a predictable fashion. The melted plastic is forced through a breaker plate supporting screens that serve as filters to retain particulate contaminates from the liquid plastic. The liquified plastic, called a "melt", is driven by the screw motion out the end of the machine and into a forming stage of the process. Producing melt with the proper characteristics for the forming stage involves careful measurement and control of temperature along the barrel. Multiple PID controllers and heaters typically create several heat zones along the screw length. Monitoring the melt pressure is also an important element of process control. One company, GP:50 Melt Pressure, manufactures temperature sensors, pressure transducers, and other measurement equipment specifically tailored for the plastics industry. The company's sharpened focus on a single industry has produced a range of specialized products that meet specific application requirements and interface well with the machinery and systems used in plastics forming. Pressure and temperature sensors and transmitters are configured with options that reflect the requirements of plastic forming operations, a reflection of the company's extensive experience in this arena. Share your plastics forming requirement and challenges with a product specialist, combining your process knowledge with their product application expertise to develop effective solutions.